Having managed to pry this lose from my son's hands I proceeded to devour it at an alarming rate - despite many intrusions of a domestic ilk. From her very first novel I have been a fan. There is something delicious about reading a book set in your own part of the woods. For those of you living in cities like London or New York, you may have become blase to this phenomenon, but to a Dunedinite it is a rare and special treat. Vanda describes Dunedin superbly: from dollar stores to state houses, green belt to Taieri Mouth, and near perfect descriptions of Seacliff. Female detective Sam Shephard is up to her old tricks. Not willing to rest on the obvious evidence she digs deeper, no matter the consequences. This book shows a maturing of the pint sized detective: not quite so flappable and a tendency to back up - just a little! 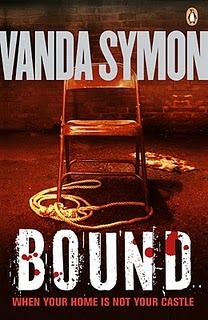 I'm looking forward to Vanda's next book - a departure from Sam, but not from crime. However, I hope we see more of Sam in the future. The story becomes more alive and real when it’s set in your hometown. Ben Sander’s crime novel Fallen did the same for me, especially the scene in Albert Park. A Certain Book - I haven't read Ben Sander yet. Another on my TBR pile. All the historicals keep pushing him down the line! I love the cover! It looks so good. And to have it set where you come from - cool! Clarissa - Vanda was very pleased when she first saw the cover too.